Back to the patio... This post covers a lot of ground and over a week of work. We begin with the soon-to-not-be precipice of death. Or at least precipice of minor pain. Probably not death. 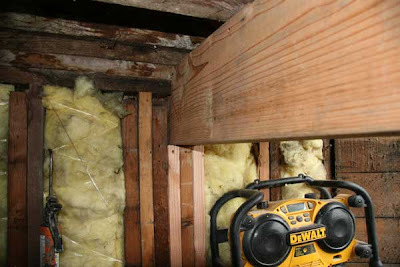 Certainly not as much pain and/or death as the attic's Pit of Death. 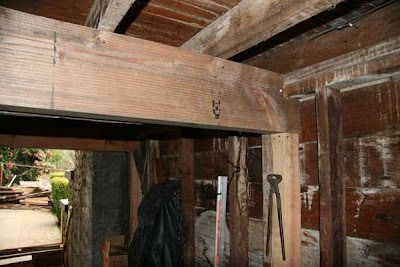 Here we see some of the new supports holding up the porch. Notice, again, how everything is attached to other things. 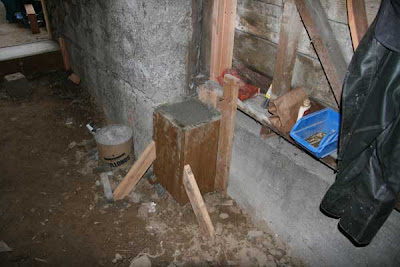 This picture was taken really to show the new big blocks securing everything to the foundation. 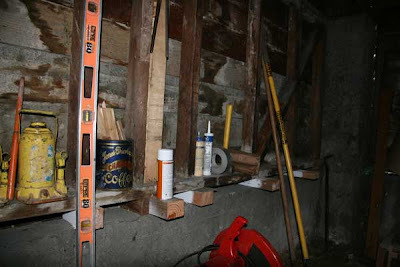 But it also shows how the space under the porch is already a great storage location. Now we move on the the "New Concrete" phase of the job. This big block is what the stairs are going to sit on. Which should provide better support than....nothing.... 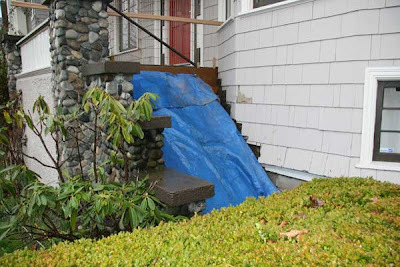 Which is what the stairs were previously sitting on. Here we see two areas of new concrete. 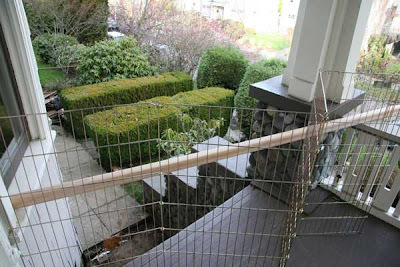 The short round column will proved a base for 1/2 of the top of the stairs. 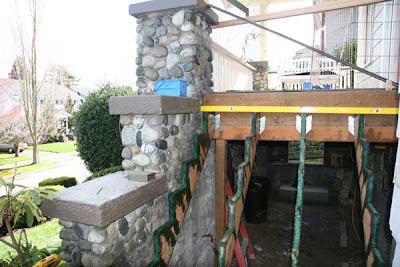 And the taller square concrete is re-connecting two previously disconnected parts of the foundation. 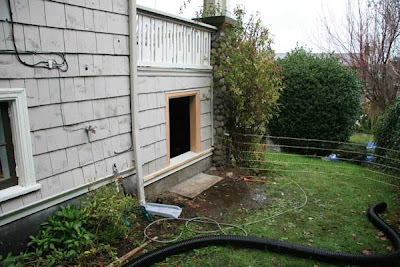 This second block wasn't pre-planed, but we ended up with extra concrete and used it to help support everything. 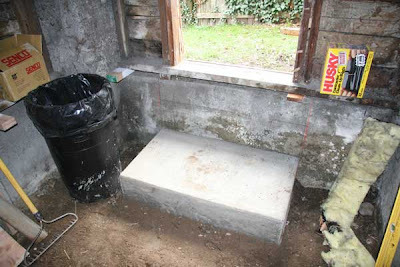 A nice big concrete step to help us into the storage area was also added. 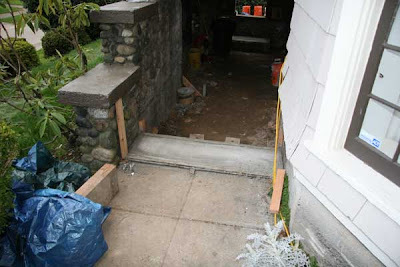 This step was planned, but a smaller step on the outside (shown in one of the later pictures) was also added to use some of the extra concrete. 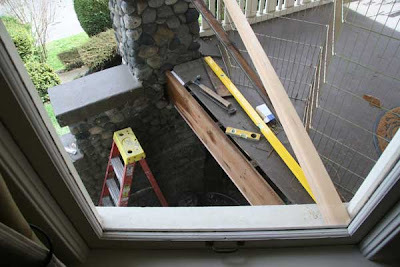 The support beam at the connection between porch and stairs was also rotting, so it was replaced with a new one. And it's starting to look like stairs again! 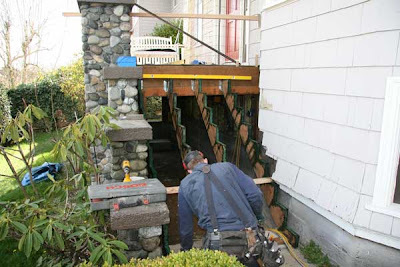 That green stuff on the stair stringers is what people in the biz call "POISON." 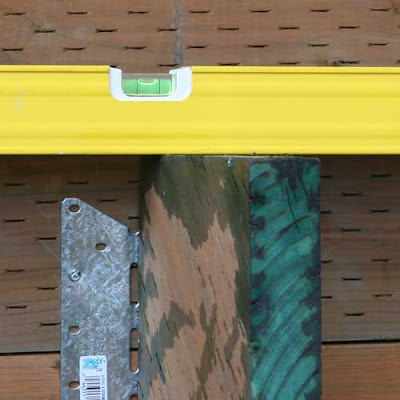 It re-treats the treated lumber where it has been sawed. The top of the new stringers. 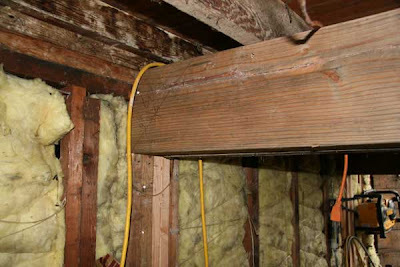 It will be good to know that something in the house is level now. NOTE: This picture was taken while the new stringer building was in-progress. There will be more than just that 1 nail holding it in place. Yet another of many pleasant changes from before.